The English ancestry of the Moulton brothers and their cousin who immigrated to New England was explored at great length in a Register article by William Haslett Jones in 1987. Since that article was published the further research has uncovered new information and new analysis of the old information has led to new conclusions. The genealogy of the 1987 article should not be used, rather the updated information in the 2009 article by Myrtle Stevens Hyde using the updated information is the most reliable. John was born about 1563. He was the only child of his father's second wife. He had three half-siblings Robert, Margaret and Grace. In older genealogies John was said to be the oldest child but his has been disproved. John inherited his father's house and land in Ormesby St. Margaret. His mother had remarried, but was widowed a second time in 1579. John married at age 21 on 14 June 1584, at the parish church of Hemsby. His bride was Ann Taylor, daughter of Robert and Margaret Taylor. The religion of the day was now firmly protestant, Catholics were in hiding, Puritanism was stirring. The Lord of the Manor was Sir Edward Clere. He had been knighted by Queen Elizabeth I in 1580 and served as Sheriff of Norfolk. The 16th century had seen a raise in enclosure of common land by large land owners. Sir Edward was complained on by his tenants for taking 30 acres of common ground and locking the gate to the common called Barrow Lowes, preventing his tenants from using the common marshes as summer pasture. Many of the land holders were called on to testify. This would have impacted John as, like his forefathers, he was a farmer. John inherited land from his father and when his brother Robert died, he inherited his house and land as well. He was called a yeoman, and left a healthy estate in his will proved 5 Feb 1637/8. He and Ann had at least nine children. He eldest son, Robert, died leaving children, named in their grandfather's will. John, son of Robert, was to receive a 'tithing' called Millers at the east end of Ormesby, in exchange for land he would have inherited from his father. Joseph Moulton was to receive his father's messuage and 11 acres of land. He was also to receive a messuage called Cordiner's. Ann Taylor Moulton survived her husband. He ordered that she would have use of the parlor chamber within the house and all his household stuff. Joseph had to provide wheat, malt, coal, faggots of wood, half the fruit of the orchard, a milk cow, and two swine. Furthermore, Joseph was directed to provide her with summer meat and winter meat. Ann would receive all this in lieu of claiming her dower or her thirds, something she would do if she chose to remarry. The only mention of his son Benjamin was a bequest to his daughter Hannah. Benjamin clearly was not alive, else he would have been named as a recipient of his father's will. His widow Mary remarried on 15 July 1623. Her second husband was William Eastow. By the time of his father's will in of Feb 1637/8 William and Mary Eastow and her son William Moulton had sailed for New England. 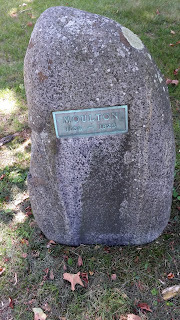 This is a revision of William Moulton's ancestry as it had previously been believed that he was the son of Robert Moulton and Mary___Moulton Estow. A review of powers of attorney in the Norfolk records office produced a power of attorney for William Moulton of Hampton, New Hampshire who wished to sell land he had inherited from his father who he named as Benjamin. Robert was the son of Thomas and Joan Green of Ormesby St. Margaret. He was most likely born in his parent's home in Ormesby. Thomas, his father, was not a land owner, and it is believed that he might have had a profession and/or some formal training. He leased land from his wife's nephew William Green. In his father's will, Robert was given draft horses, and farming implements. In a 1597 indenture, Robert Moulton, husbandman of Scratby, leased from Sir Edward Clere, lord of the manor of Ormesby, 22 parcels of land for 25 years. 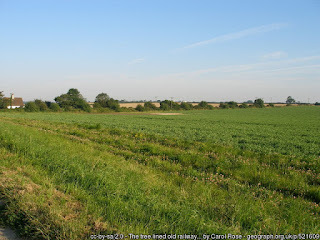 Most of the land was in Scratby; two parcels were in Caister. In a 1620 document, Rental of the Manor of Ormesby, then held by William Baispole, Robert Moulton held land in Scratby Bardolphes, some of it freehold. Robert married Mary Smythe of Hemsby 1595. She was the daughter of Henry Smythe of Hemsby and possibly his wife Brydgett who was buried on 4 Jan 1611/12. In an earlier article Mary's father was misidentified as John Smith of Caister, but in his 1625 will, Henry Smythe calls Robert Moulton his son-in-law. He left Robert 24£, a half share of a marsh and the residual of his estate. Henry also named his great-grandson and namesake Henry, son of John Moulton. This confirms the relationship between Mary and her father. Henry, of note, had a estate valued at over 600£, the second largest in East Flegg from 1580-1680. Robert and Mary had at least ten children. Three sons, John, James and Thomas immigrated to New England. Robert died, probably at Scratby and was buried at Hemsby on 11 October 1633. Mary survived him and died in 1636, she was buried at Ormesby St. Margaret on 27 April 1636. In his will Robert called himself a yeoman. He left his wife Mary all his plate, four milk cows, four feather beds, ten milk bowls, four cheese vats, a table, four chairs and six stools. He had a house in Ormesby and his house and land on which he lived. He left money to his daughters, servants and grandchildren. He had definitely come a long way. William Haslet-Jones, "The English Background of Some Early Settlers of Hampton, New Hampshire From Ormesby St. Margaret, Norfolk," (The Moulton Family) The New England Historical and Genealogical Register (October 1987) Vol. 141, 313-329, digital images, American Ancestors (https://www.americanancestors.org/DB202/i/11613/313/0 : accessed 28 December 2017). Joan Wade Moulton, "Some Doubts About the English Background of the Moulton Family," The New England Historical and Genealogical Register (July 1990) Vol. 144, 245-263; digital images American Ancestors (https://www.americanancestors.org/DB202/i/11735/245/0 : accessed 28 December 2017). (https://www.americanancestors.org/DB202/i/11686/129/0 : accessed 28 December 2017). 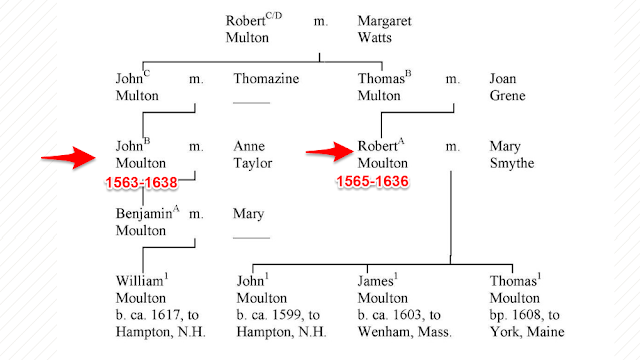 Myrtle Stevens Hyde, "Revised Ancestry for William Moulton of Hampton, New Hampshire, Including Some Revisions of the Early Ancestry of His New England Cousins," New England Historical and Genealogical Register (July 2009) Vol. 163, 165-173 and 273-277; digital images, American Ancestors (https://www.americanancestors.org/DB202/i/11728/165/0 : accessed 28 December 2017).